Girl Scouts vs. Boy Scouts: A food drive for the ages! If you’ve stepped into any store, big box or local, within the last week you’ll have noticed that the “holidays” have officially begun! In honor of the spirit of the season, we are holding our first-ever collaborative food drive with the Boy Scouts of Tahquitz District — yep, it’s Girl Scouts versus Boy Scouts! The food drive and corresponding family fair will be held on November 18 from 4:30pm to 7:00pm. The address is 39140 Winchester Rd. Murrieta, CA 92563. Join us as we join forces to help stock the local food banks with food for Thanksgiving. While both our organizations generally run our own food drive campaigns, this year we have joined forces to make a statement that together we can all achieve more. 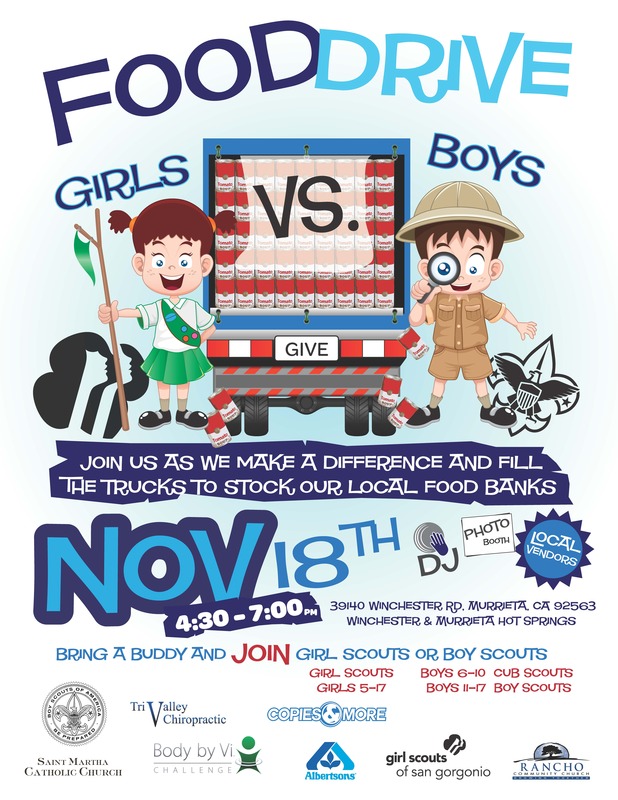 While this food drive is being hosted by the Girls Scouts and Boy Scouts, you do not need to be affiliated with either organizations to participate. This is a “come one, come all” event with a competitive edge – choose which truck you want to fill! Also supporting this amazing community event is Tony Belden of Copies and More, Brett McClaws of Tri Valley chiropractic and many more local organizations. Newly elected officials will be stopping by to lend their support, as well. After you drop off your canned good donations stay for some music and treats. This is the perfect opportunity to mingle with the many local organizations who will be in attendance. As always, if you there are families looking to register their girls or boys both organizations will have membership teams on duty to assist. We challenge every local resident to donate; imagine if every Girl Scout or Boy Scout donated just one can of food – the food banks would be over flowing! Previous Previous post: Girl Scouts learn positive body image at Barbie Sleepover! Next Next post: Great Opportunities by Carolyn C.